We provide a balanced educational programme within a safe and stimulating environment, so that each child embarks on a physical, intellectual and social journey of curiosity and reasoning. Anan thus offers a comprehensive and a balanced curriculum which is designed to make learning enjoyable, activity-based and experimental, preparing every student for higher challenges. 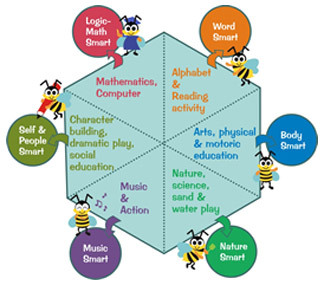 Nurturing Multiple IntelligenceWe have a well-balanced curriculum model & activities to nurture linguistic, logical & mathematical, naturalistic, spiritual, bodily – Kinesthetic, musical, interpersonal & intrapersonal intelligence.